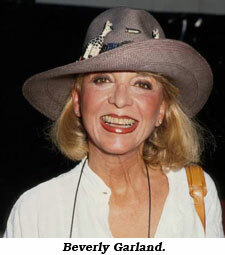 Will Hutchins on Beverly Garland, Carmen Rocha, Phyllis Welch, Cheryl Holdridge. A few years ago I had the honor of working with Beverly Garland at the Friends of Old Time Radio Convention in Newark, NJ. We acted in a re-creation of a “Have Gun Will Travel” radio show. I played an old gold prospector with a parrot that cussed. Beverly played one of the town ladies who hired a gunslinger to rub-out this blot on the community’s chastity. I called upon my ol’ compadre Paladin to come save my parrot’s life. There was something in Paladin’s bearing, his voice, his eyes. The itchy-fingered hombre for hire got the picture. Checkmate. The gunslinger quietly got on his horse and rode out, back down the mountain. Not a shot was fired during the show’s half-hour. Babs and I loved Beverly Garland. Still do. Babs, take it away—“Oh my, how I loved being in the presence of beautiful, brainy and boisterous Beverly Garland! She had such a great style…and oh, that laugh! On several occasions I happened to notice the plethora of crosses hanging around her neck—gold crosses, silver crosses, bejeweled crosses…lots of them—and she wore them with such panache! Then and there I decided this was the necessary accessory for my own Southwestern dress code. Now, whenever I layer on my own multiple gold crosses, silver corsses and bejeweled crosses, I always tell folks it is my homage to Beverly Garland. After college my first job was cafeteria bus boy. I couldn’t stand up straight after bending over tables all that first day. I hobbled home, Quasimodo style. Made me appreciate wait staffs. Aces in my book. They laugh at my jokes, especially at tipping time. 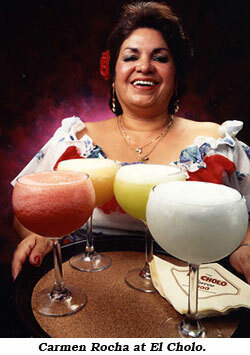 Carmen Rocha was the star waitress at my favorite L. A. Mexican restaurant, El Cholo. She worked there for 40 years. The restaurant lounge was renamed ‘Carmen’s Cantina’. She worked both sides of Western Ave. Directly across from El Cholo she established Carmen’s Cafe. Good eats, you bet. Every year I gave her my two Oscar Show tickets. She, in turn, treated Babs and me to a dinner. The Academy caught on and clamped down. Carmen grew up in San Antonio. She moved west and introduced nachos to L. A. She made them in the kitchen as special treats. They caught on and were added to the menu. Now, all Angelenos eat nachos. They should be called Carmens. Her name would be remembered forever, like Margaritas. After years of wondering about Phyllis Welch, I finally attained closure. She died September 26, ‘08 in San Mateo, CA, age 95. Born in Toledo, OH, July 16, 1913, she was a stage actress, making her Broadway debut in “A Slight Case of Murder” in ‘36. She married businessman Graeme MacDonald in the late ‘30s and left acting to raise a family in Hillsborough, CA. She founded the Peninsula Children’s Theatre in San Francisco in the ‘50s. Her sole screen appearance was in “Professor Beware”, 1938. I’ll always remember my phantom of delight. Phyllis Welch. Her bearing! Her voice! Her eyes! 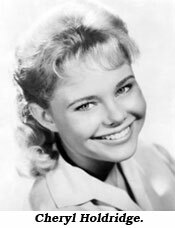 My favorite Mousketeer, Cheryl Holdridge, is also gone. I worked with this lovely lady back in ‘63 at MGM in an unsold pilot, “Take Me To Your Leader”, a rip-off of “My Favorite Martian”. A unique experience. All week I worked from dawn till noon at MGM. Then I flew to Chicago for the evening performances of “Never Too Late” at the Blackstone Theatre with William Bendix and Nancy Carroll. Working with Cheryl was joyful. Her hubby-to-be Lance Reventlow was a frequent visitor. Where were you the day JFK was shot? I’ll never forget. I was on MGM’s Central Park set. Some alien had slipped me anti-gravity pills. I was holding on to a park light, my feet high in the air. If I let go I’d float off into space like a balloon. Police officer Robert Strauss was most displeased with my behavior. The director shouted, “Cut! Print! That’s a wrap!” Just then, the horrible news reached our sound stage like a kick to the stomach. My legs were still wired, and I was dangling upside down, swaying to and fro. Too numb with grief to call out. A kindly grip finally lowered me, and I returned to earth. Hurried good-byes. I had to get back to Chicago. The show must go on. I never saw Cheryl Holdridge again. Because of heavy fog we landed at O’Hare Airport via Pittsburgh. I was late! I let the show down! Step on it, driver! We reached the Blackstone Theatre, and it was totally dark. The show didn’t go on—November 22, 1963. Our president had been assassinated.